Astronaut Jack Fischer aboard the space station used the lab’s Canadian-built robotic arm to snare the robotic cargo craft at 6:52 a.m. EDT (1052 GMT) Wednesday as they sailed about 250 miles (400 kilometers) over the Pacific Ocean north of New Zealand. 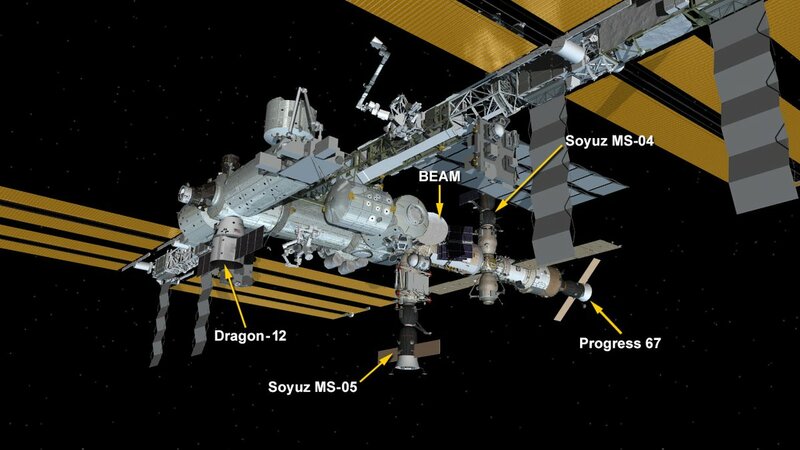 Around two hours later, ground controllers finished the installation of Dragon on the station’s Harmony module, commanding 16 bolts to close and create a firm seal between the two vehicles. The station crew opened hatches between the Harmony module and Dragon’s pressurized compartment later Wednesday, a day earlier than planned. Flying under contract to NASA, the SpaceX supply ship ferried mostly research hardware, but also carried computer equipment, clothing, fresh food, ice cream and other treats for the crew. The cargo mission marked SpaceX’s 11th successful operational supply delivery in 12 tries. 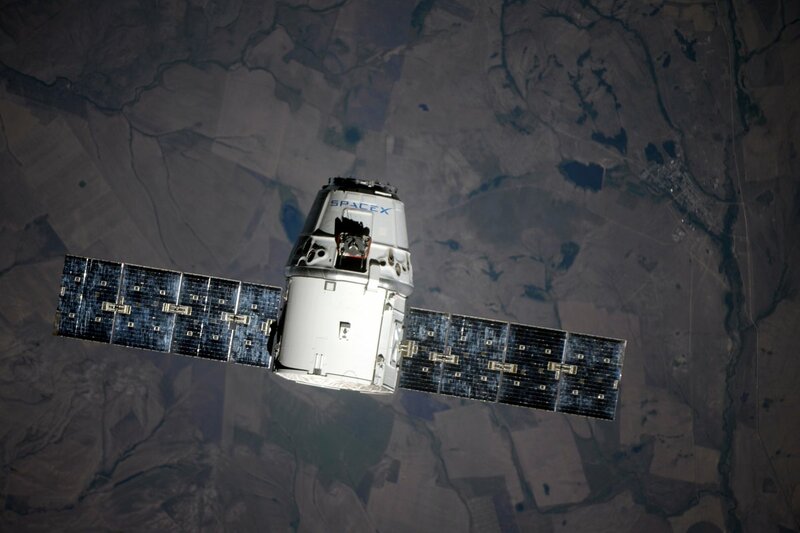 NASA inked a $1.6 billion contract with SpaceX in 2008 for 12 logistics flights to the station. 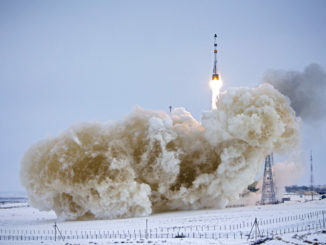 This mission wraps up work under the original resupply contract, but NASA extended the agreement for eight additional cargo launches through 2019. SpaceX also has a separate, follow-on contract with NASA for at least flights of upgraded Dragon cargo capsules to the station from 2019 through 2024. Orbital ATK is NASA’s other cargo transportation provider, using Cygnus supply ships launched on Antares or Atlas 5 rockets. Sierra Nevada Corp. is developing its own cargo vehicle, called the Dream Chaser, which will return landings on a runway like the space shuttle when it begins flying as soon as 2020. 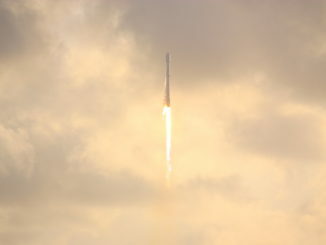 The gumdrop-shaped Dragon cargo freighter, powered by two extendable solar array panels, lifted off Monday on top of a Falcon 9 rocket from NASA’s Kennedy Space Center in Florida. The station’s six-person crew will unload the payloads inside, overseeing a multitude of biological experiments before the ship’s departure and return to Earth next month. Researchers will examine the blood vessels inside animals’ eyes and the blood-brain barrier that regulates fluid movement inside the skull. “The second thing that we’ll be doing is really looking at the brain circulation, and how that affects blood pressure within the skull,” Delp said. Part of the rodent research team will look at how an extended stay in the space station’s weightless environment affects movement. “In microgravity, you have a fairly severe physical inactivity, and that can affect a number of the organ systems, such as muscle and bone loss,” Delp said. One focus of the study will be on how much cartilage in joints degrade after spending time in microgravity. Mice have an accelerated metabolism and undergo changes faster than humans, so a month on the space station is roughly equivalent to a three-year expedition by an astronaut, according to Delp. The space station cargo mission will also help biologists investigating Parkinson’s disease, a chronic neurological disorder that affects a million people in the United States, and about five million worldwide. “Although there are medications that ammeliorate the symptoms, we don’t have any therapies that reverse or slow down the progression of the disease,” said Marco Baptista, director of research and grants at the Michael J. Fox Foundation, which funded the station-bound experiment. Scientists are sending a protein that causes Parkinson’s to the station to measure how it grows without the influence of gravity. The protein, named LRRK2, could be targeted with drugs and therapies in Parkinson’s patients if doctors understand it better. Growing the protein in microgravity “will lead to bigger crystals, more regular crystallization and crystals with higher intrinsic order,” said Sebastian Mathea, the lead scientist on the LRRK2 experiment from the University of Oxford. “With those crystals, we hopefully will be able to collect data that allow us to solve the three-dimensional structure of LRRK2, which hopefully will push forward the understanding of the onset of Parkinson’s,” Mathea said. Another science team awaits results from an experiment probing how microgravity affects the growth of new lung tissue, specifically bio-engineered material tailored to repair damaged organs or reduce the chance of organ rejection in transplant patients. Scientists have trouble managing the expansion of bio-engineered lung tissue on Earth. The tissue has trouble moving through structures designed to help shape it, and stem cells used to produce the tissue are slow to replicate, according to Joan Nichols, professor of internal medicine and infectious diseases and associate director of the Galveston National Laboratory at the University of Texas Medical Branch in Galveston. Nichols said microgravity offers a more benign environment, aiding in cell dispersal to help form more uniform tissues. A supercomputer developed by Hewlett Packard Enterprise will spend at least a year on the space station, helping engineers gauge the ruggedness of commercial computer components in the harsh conditions of space. Most computers sent into space are physically hardened to withstand radiation, cosmic rays, and other rigors of spaceflight. Hewlett Packard said its “spaceborne computer” experiment was hardened with software, reducing the time, money and weight of the supercomputer. The experimental computer passed at least 146 safety tests and certifications to win NASA approval for the trip to the space station. If it works, Hewlett Packard officials said it could help future space missions, including a human expedition to Mars, have the latest computer technology. While astronauts get to work in experiments inside the station’s lab facilities, the Canadian and Japanese robotic arms will remove a cosmic ray detector carried inside the Dragon’s external payload bay for mounting on a facility outside the station’s Japanese Kibo module. Derived from an instrument carried aloft on high-altitude balloons, the Cosmic Ray Energetics and Mass, or CREAM, payload will spend at least three years sampling particles sent speeding through the universe by cataclysmic supernova explosions, and perhaps other exotic phenomena like dark matter. Scientists think the subatomic particles could hold the key to unlocking mysteries about the universe. The biggest of the bunch, named Kestrel Eye 2M, is a pathfinder for a potential constellation of Earth-imaging spacecraft for the U.S. military. About the size of a dorm room refrigerator, the Kestrel Eye 2M satellite was developed by the Army’s Space and Missile Defense Command over the last five years. While satellites the size of Kestrel Eye lack the fine imaging capability of large commercial and military spy satellites, they cost significantly less and could be spread around the planet in fleets of dozens or more. Battlefield troops could connect with one of the satellites as it soars a few hundred miles overhead, ask it to take a picture of a nearby target, then receive the image, all within a few minutes. From the space station’s altitude around 250 miles (400 kilometers) up, Kestrel Eye 2M’s optical camera will be able to spot objects on Earth’s surface about the size of a car. The Army has not approved development of further Kestrel Eye satellites. The demo craft set to launch Monday will be employed in military exercises with Pacific Command over the next few years, and Pentagon officials will evaluate its usefulness before deciding whether to press on with the program. 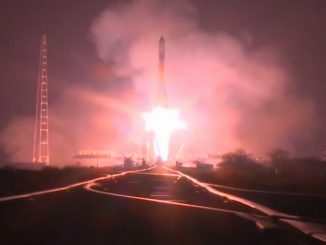 Three CubeSats were also ferried to the space station for release from a ground-commanded deployer in the coming months. The ASTERIA mission, developed by a team at the Massachusetts Institute of Technology and NASA’s Jet Propulsion Laboratory in California, seeks to test miniature telescope components that could be used in future small satellites to observe stars and search for exoplanets. ASTERIA is about the size of a big shoebox and weighs around 26 pounds (12 kilograms). Astronomers and engineers want to know if a CubeSat like ASTERIA can hold pointing to the precision necessary for stellar observations, and designers will also measure the performance of the focal plane inside an on-board telescope. The Dellingr project spearheaded by NASA’s Goddard Space Flight Center in Maryland aims to prove out a new type of microsatellite design that is more reliable than conventional CubeSats. Around the same size as ASTERIA, the Dellingr CubeSat, named for the mythological Norse god for the dawn, took around three years to design, build and test. Officials said the effort was not always easy, and managers had to define a balance between affordability and reliability. Engineers tried using commercially-available components and software, but testing revealed many of the parts were inadequate for the level of reliability sought for Dellingr, which carries a sensor suite to study the sun’s influence on Earth’s atmosphere. But officials said the extra testing paid off, and Dellingr is now ready to fly after helping reduce the risk of unforeseen problems on future missions NASA has approved work on a follow-up CubeSat incorporating Dellingr’s design and lessons to make measurements of Earth’s ionosphere. Another CubeSat named OSIRIS-3U from Penn State University launched inside Dragon will study space weather. Working in coordination with the Arecibo Observatory, a giant radar antenna in Puerto Rico, OSIRIS-3U will fly into a region ionosphere heated to simulate the conditions caused by solar storms. OSIRIS-3U will collect data on the electron density, temperature, and content in the region of space stimulated by radar emissions, according to a fact sheet released by NASA. The Dragon spacecraft is scheduled to depart the space station Sept. 17, bringing home more than a ton of research specimens and other gear for a parachute-assisted splashdown in the Pacific Ocean southwest of Los Angeles.